Cedar siding shingles provide beauty for any home, but they must be properly coated to ensure a long life. Cedar shingles contain extractives that bleed to the surface when the wood becomes wet and then darken as the wood dries. Those extractives can even bleed through many types of paint. The best way to prevent extractive bleed is to select a paint or stain that forms a seal over the cedar. 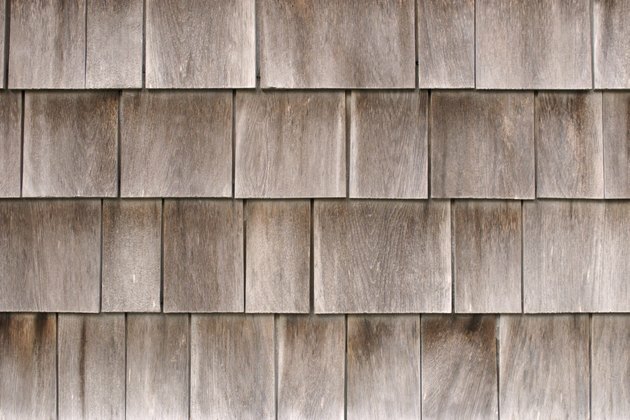 The right coating can protect and beautify cedar siding shingles. Semi-transparent stains are lightly pigmented to show off the cedar's natural grain variations. These stains penetrate into the cedar and harden up its surface enough to make it resist moisture from rain, snow and ice. Semi-transparent stains are available in alkyd-based or water-based formulas, but neither option offers limited protection against extractive bleed. The better grades of these stains are typically effective for three to five years, but their performance can be significantly enhanced by applying a water sealer as a top coat. Solid color stains are usually supplied in a color palette that may be limited to less than a hundred shades of brown and gray. Like paint, a solid-color stain forms a protective film over the wood. But there's an important difference as well, because these stains will highlight the cedar's natural texture. Solid color stains are typically available in a matte finish only. When choosing a solid color stain, look for a brand that is moisture resistant, mildew resistant and crack resistant with a warranty of five or more years. Properly primed, a 100 percent acrylic latex paint will provide decades of protection for cedar siding shingles. These paints form a tough but flexible film that allows moisture within the wood to escape while protecting the cedar from atmospheric moisture that might lead to extractive bleed. Acrylic latex paints are available in thousands of colors, although whites and off-whites are the traditional choice in many regions. In addition, these paints can accept performance-enhancing additives that increase resistance to mildew and insects. At one time, the recommended base coat for cedar siding shingles was an alkyd-based primer. While that may still be a good choice in many locales, those coatings have some drawbacks in regions with extreme winter to summer temperature shifts because an alkyd primer can crack when it is unable to expand and contract with the wood. A 100 percent acrylic latex primer is a more flexible option that can seal the wood from atmospheric moisture. Some exterior stain manufacturers provide both alkyd and water-based primers that are specifically formulated as a protective base coat for solid color stains. Many homeowners prefer the look of weathered wood, and there are coatings that allow that effect while allowing limited protection for the wood. Applying a water sealer without using a stain will allow the cedar to turn gray naturally over time while protecting the wood from extractive bleed. Conversely, applying a water-based stain will protect the wood from turning gray, but raise the wood grain and eventually allow extractive bleed to darken the lower segments of the shingles. Both forms of weathering can be reversed, but the weathering may reduce the life expectancy of the siding.